num-executors Total number of YARN containers to allocate for this application. 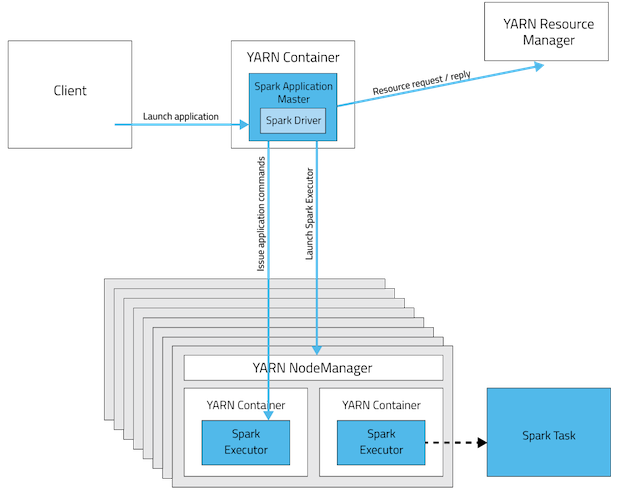 Alternatively, you can use the spark.executor.instances property. If dynamic allocation is enabled, the initial number of executors is the greater of this value or the spark.dynamicAllocation.initialExecutors value. To disable dynamic allocation, set spark.dynamicAllocation.enabled to false. If you use the --num-executors command-line argument or set the spark.executor.instances property when running a Spark application, the number of initial executors is the greater of spark.executor.instances or spark.dynamicAllocation.initialExecutors. For more information on how dynamic allocation works, see resource allocation policy. spark.dynamicAllocation.initialExecutors The initial number of executors for a Spark application when dynamic allocation is enabled. If spark.executor.instances (or its equivalent command-line argument, --num-executors) is set to a higher number, that number is used instead.